Are you physically or mentally running on E? Are you racing “90 to nothing” in your daily life? until something forces us to hit the brakes or the emergency brake is applied. Instead of clearing our plates, we add sideboards onto them so that we can accept more. We wear many hats outside of work such as a family member, caregiver, volunteer, student, etc. Some days we find ourselves in foul moods where we lack comprehension, patience, and focus. Is it because we are hangry (hungry + angry) or just plain ole tired? You’ve heard the saying; “you can’t squeeze blood from a turnip”… or is that a beet?…LoL, you get the point. How do we avoid the breakdown that can and will happen if we keep pushing ourselves without intentional refueling? Block scheduling: I shared a photo of a tool that I use, but you use what works for you. The key thing is for you to understand where you can capture time for yourself to refuel. Take lunch: Go visit a local library, museum, or sit in your car at a local park. Vacation: Plan for it, and take it. But leave some recovery time, so you are not rushing back to work the next day. Another option is weekend trips or a day-cations while kid(s) are at school. Nurture your hobbies: When was the last time you ____________? Guard your time: Once you’ve blocked it out, it’s yours. Don’t let others guilt you into giving it back. Slowly implement some of these tips into your life, and remember an empty tank is just that. Empty. You will be more productive by taking care of you, and you’ll be better able to wear all those hats. Generosity is one of the four essential elements youth need for positive youth development. 4-H clubs should do at least one community service project a year as part of their plan of action. This benefits our high school students because most students need service hours as part of graduation requirements. But with all the “have-to-do’s” in life, service can become just a thing to check off and have no real value. How can we help our 4-H youth get more value from service projects? Use the Experiential Learning model (Do-Reflect-Apply) used by 4-H programs across the nation. Incorporating the reflect and apply portion of the model does take some effort, but it is not hard to do. If your club does many community service activities, choose which ones to incorporate all the steps of the Experiential Learning model. Get buy in from youth concerning the service project(s) planned for the year. UF/IFAS Extension Gadsden County 4-H Club members out delivering Thanksgiving baskets to families in need. What is something you learned by doing this project that you could use in other areas of your life. Here’s a great article in the Florida 4-H Volunteer Training Series that really breaks down the process. You can also give your local UF/IFAS Extension 4-H Agent a call for more help. How can you keep up with the great things we’re doing in our 4-H extension district? 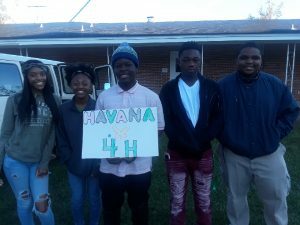 Gadsden County 4-H youth on campus for 4-H University. 4-HU is the premier youth leadership development event of Florida 4-H. Many of us have heard the saying, “oh, that young man or woman is such a natural born leader.” But are leaders born that way, or do they develop into leaders? 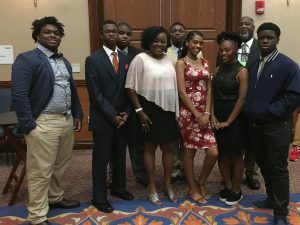 These Gadsden County delegates took advantage of 4-H University this summer – an awesome Florida 4-H state event designed to grow leadership skills. Many of them have also served as volunteer 4-H camp counselors during the summer. They understand that leaders are developed and not born. Sometimes people confuse charisma with leadership abilities. Charisma is a special magnetic charm or appeal (Merriam-Webster Dictionary). Many of our local to national leaders have some level of charisma. In addition to charisma, leaders should have the more important skills such as communication, problem solving, critical thinking, managing, and self-awareness. There are many definitions for leadership because there is no universal definition. Leadership involves a process while a leader is the one who carries out the process. How Does 4-H Unlock Your Leadership Potential? One of my favorite teaching tools used to develop my Gadsden County 4-H leaders is the “Unlock Your Leadership Potential” by UF/IFAS Extension. It has influenced how I would define a leader. The overall goal of a good leader is to move the group or organization toward its goals while building a sense of togetherness and well-being. Florida 4-H grows leaders at the club, county, district, and state levels by creating safe and nurturing environments and providing quality experiences. Knowledge and skills are great, but being able to apply them through experience is what fortifies and matures youth as well as increases their confidence. The 4-H slogan, “Learn by Doing”, is why the 4-H Experiential model is important to UF/IFAS-Extension 4-H Youth Development Program. The more active the youth and the duration of a their engagements in 4-H positive youth development the greater the benefits not just for them but also their communities (2013, National 4-H Council). It takes a whole team of Extension professionals, staff, 4-H Seniors, and volunteers to make the “magic” happen. Rutledge. J and et. All (1997). Unlock Your Leadership Potential. UF/IFAS Extension, Gainesville, Florida. When most people hear or read the word diversity, they automatically think of the race and gender. Some may think of social economic status or religion. The Ohio State University Extension defines diversity as “the differences among people with respect to age, socio-economic status, ethnicity, gender, physical and mental ability, race, sexual orientation, spiritual practices, and other human differences” (https://hr.cfaes.ohio-state.edu/diversity/DR_Sec1_Guide06.pdf), which is also the same definition used by the Washington State Extension’s Navigating Differences curriculum. The training challenged me in my thinking in many ways. One of my “aha” moments came when it was shared that there are more differences within a cultural group than between groups. Do you question this statement? If so, here is your first challenge: Look up the Diversity Wheel. 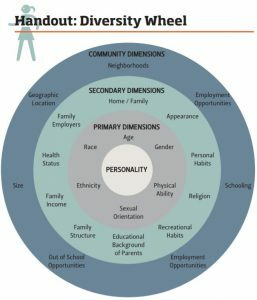 What is a diversity wheel? It is the dimensions that make us, well, us. You will discover there are somethings that are core to you and permanent – located at the center of the wheel. All other dimensions, which develop over a lifetime, are found on the outer rings of the wheel. The next phase of your challenge is to look at your group (family, organization, or ethnic group) and examine factors including the following: age, gender, income, physical capacity, health status, beliefs, meal practices, size, height, educational background and hobbies. These are just a few areas, but you will discover more after you look up a diversity wheel model. Why should we examine diversity? Working with people, whether in a personal or professional setting, is complex. The better your understanding of yourself and others is, the more productive your interactions will be. Remember, we are unique and come from different experiences that we bring that to the table with us. Green and white are the colors of 4-H but what else can you think of that is green and white? Money! So, how does 4-H livestock projects teach financial management for the youth who participate in these programs? I am so glad you ask. We will take a journey into the 4-H Livestock world where I will show you the $$$ and how youth learn financial management. One of the most common ways is through livestock market and showmanship events. Youth can earn money base on how the animal is judges as well as how well the displayed/showed their animals. Another common way is through participating in terminal shows in which the animal is sold during the event. Youth can breed their animals and sell their offspring, or they can sell products their animal produces such as wool or eggs. Youth can also earn premium money by submitting their project record books to be judged and by participating in livestock judging events. Now that I have tackled how 4-H Livestock youth can earn money through their projects let look at money management. The 4-H Livestock project record books have sections to record expenditures as well as income. Youth learn if the project was profitable or not. As youth review expenditures, they have an opportunity to make decision such as if blank high-end feed is really worth the money or does a less expensive feed provides the same benefits. As most youth mature, their understanding of managing money in relationship to their project improves. They can carry that knowledge gained from their livestock project over to other areas of their lives. Project record book workshops assist youth in completing their project record book especially the financial portion. At times, these workshops have been eye openers for parents. Many of my 4-H youth shared in their project stories how they were required to invest back into their project by purchasing their show animal for the next year. I have also read how many of my 4-H youth, set higher goals for the profits from their projects such as buying a car or saving for college. Here is a great example of how one 4-Her used her livestock project to save enough money to purchase a house! Now that I have shown the money in 4-H Livestock project, you may be interested in learning more about the animal science projects offered through Florida 4-H. If you are interested in helping youth learn how to manage their money through their livestock project, consider becoming a 4-H volunteer. We offer a wide variety of volunteer roles to fit your interests, skills and schedule. Learn more at http://florida4h.org or contact your local UF IFAS County Extension Office.